Let me break it down for you. I don't hide it when I don't like a food. I won't force myself to eat anything I don't think is tasty. And I will always be honest with you when it comes to your cooking. Kevin arrived this evening. And for a while I had a grand feast planned out for tonight's dinner. Eventually, dinner expanded to not only include Farnoosh, Kevin, and I, but also Matt and Daniel. Still, I made adjustments ahead of time and was very excited about this meal. Let me just tell you. Not so delicious. Not terrible, but definitely not tasty. I've also come to learn that quinoa...is pretty awful. Which is a shame, because it's supposed to be so good for you, and I was super duper excited about cooking it [not to mention it's also low-GI, so it would have fit perfectly with my pre-diabetes]. Maybe I just used a bad recipe [although it got quite a few 5-star ratings, so I was severely disappointed], but that stuff tastes like dining hall oatmeal. Mixed with vinegar and some chopped up veggies. Yuck. Also, I went to the Farmer's Market this morning to pick up some tomatoes [for an easy tomato and onion salad, which was actually quite good], Italian bread, and chicken [for Moroccan chicken that I was planning on making as the entree]. Got there, picked up my tomatoes and bread, ate some delicious treats for breakfast, and discovered that chicken breasts are $14 a pound. Now, I'll be the first to accept that quality comes at a price, and I would much rather spend $14 a pound on grass-fed, happy chicken meat than on terrible supermarket, corn-fed, factory farmed chicken meat, but let's be real. I'm a second year college student with almost no money [haven't gotten paid yet!]. Sad life. So instead I stopped by the international market on the way home, which I had never been to before [and loved, which is ironic because it is a carbon copy of every Pak-Indian market my parents have dragged me to over the years, but I mean if they're going to give me free samples of kaland...]. There I bought some excellent whole-wheat pita and really awful hummus. But I didn't know the hummus was as awful as it was until I cruelly fed it to everyone at dinner. Ugh. Though, thank goodness for leftovers, because we just heated up some of my pesto from yesterday and had a bit of that instead. So all in all, an uber fail. BUT, I still had dessert on my side. photo taken by Kevin and his amazing skills/lens. muy jealous. Cinnamon raisin bread pudding, to be exact. Quite delicious. Ate it hot out of the oven with some vanilla ice cream on top, and it was pure bliss. Preheat oven to 350 degrees Fahrenheit. Grease a 2-quart casserole dish. Spread bread cubes evenly over the dish. Pour warm milk over the bread and let sit while preparing the rest. In a bowl, combine sugar, cinnamon, nutmeg, eggs, and vanilla. Pour mixture over the soaked bread. 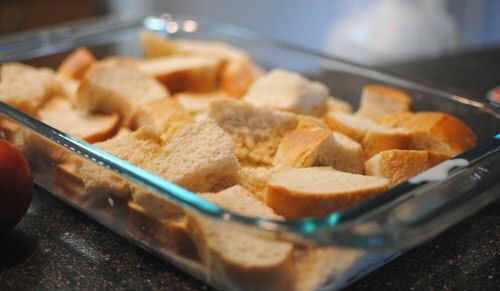 Toss to coat all bread with mixture. 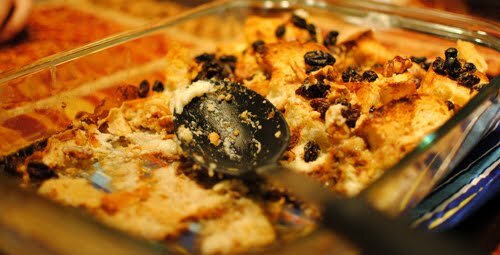 Sprinkle raisins and nuts over the bread pudding. Bake for 50-60 minutes. Meanwhile, prepare the brandy sauce. Beat all ingredients together until it forms a smooth paste. Refrigerate until bread pudding is done. Pour sauce immediately over the hot pudding. Eat while warm. Serve with vanilla ice cream, if desired. It was so good. Though, I once again failed to remember that my oven overbakes everything just slightly, so it was a lot like eating cinnamon croutons with vanilla ice cream. But still, delicious. I like to think it made up slightly for the torturous meal. In other news, thank goodness I'm fasting tomorrow, because all this starch these past two days are taking a huge toll on my tummy. Ugh. Kind of funny how up until Friday I had been giving up all refined and artificial sugar, and made it a good 23 days [for any of you not in the know, I had made a vow to give up all refined and artificial sugars for 30 days]. I pretty much just reversed any and all of my progress within the past 48 hours. But I'd say it was pretty worth it.